(One Kendall Square, Cambridge, MA 02139, USA. Phone (617)494-1224). Up to 1984, the company was called Trillium. Some of their games are published on the "Windham Classics" label. The 1984 released titles by Trillium/Telarium were eventually sold three different ways. In 1984, they were from Trillium and released in double-folded over folders (8" X 10") with seals holding in the contents. 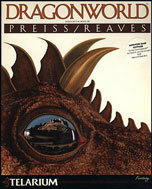 In 1984, the folder form remained the same as the games were marketed by Telarium. Around 1986, the folder concept was dumped and the games came in regular flap type boxes (6 3/4" X 9") with a plastic insert tray. Telarium went defunct sometime before 1989, but some of the games continued to be marketed by Spinnaker a while after that. They are or have been distributed by Spinnaker Software Corporation. Type: Bitmap graphics/Music Written 1984 by Len Neufeld and Byron Preiss. Notes: Based on the novel of the same name by Ray Bradbury. Comes with a manual, Notes from the Underground and a Criminal Alert Notice card. Comments: You are Montag, a fireman whose job it is to burn books, but instead you join a secret organization that tries to preserve books. The time is not too long from now. The place is New York City. Yet it is a setting few of us would ever recognize. For this is a world where simply owning a book is dangerously illegal. Where Firemen come not to save houses, but to burn them for the books inside. And where you, once a dedicated Fireman, are now a rebel with a passion for books --- and the most wanted fugitive in the country. There are still a few people who can help you --- your fellow members of the Underground. They can tell you how to fool the deadly Mechanical Hounds, how to steal a Fireman's uniform, how to avoid the military ID checkpoints. Yet escape is not your main concern. You are possessed, driven onwards by your own unflinching ideals. You feel a desperate need to fight, to push back ignorance, to vindicate every page a Fireman has ever burned. 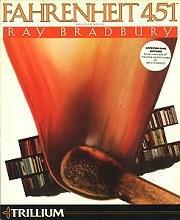 Fahrenheit 451 is the first computer adventure game to be produced in collaboration with Ray Bradbury. It offers an advanced parser, mutiple disk sides for extended play, and the ability to be played with or without graphics. Also included with this package is a specially written prologue by Mr. Bradbury that establishes the background for the game. RAY BRADBURY, world-renowned author of such science fiction classics as The Martian Chronicles and The Illustrated Man, has written for television, theatre, radio, and film, and has been published by virtually every major American magazine. Written over thirty years ago, Fahrenheit 451 remains his best-known work, and is an acknowledged classic as well as one of the world's finest science fiction novels. "I'm thrilled to be participating in the evolution of my Fahrenheit 451 into a computer adventure. For anybody curious about what happens to Montag after the book ends, or about what science fiction software might be, here is an exciting place to start." Type: Drawn graphics/Music Written 1984 by Ronald Martinez. 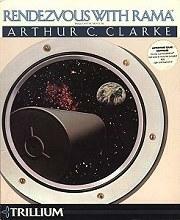 Notes: It is based on the book of the same name by Arthur C. Clarke. The package includes a 9-page Rendezvous with Extraterrestrial Phenomena Commander's Handbook with a seal on it (comes with a cover in both black and red - the black may be from the Trillium release and red, the Telarium), a coded hint sheet featuring LRSC protocol messages to Commander Norton (originally contained inside the sealed manual) and a 21" x 9" fold-out blueprint-type grid map of the ship. The map is necessary so solve the game. The game contains two action sequences that can be practiced with a special command. Comments: Explore the strange alien vessel Rama, complete with cities and some very extraordinary inhabitants. Type: Bitmap graphics/Music Written 1984 by Michael Crichton. Notes: This game contains two arcade sequences. 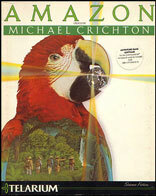 The plot more or less follows Crichton's novel "Congo", except it takes place in the Amazon. I have reports that it was published by a company called FilmTrack (Michael Crichton's own software company). This report also says the game is from 1982. Could it have been published there first and then later by Telarium? Comments: You must penetrate a South American jungle, along with your sidekick, the obnoxious parrot Paco, to find a lost city and discover why an entire expedition was killed. Type: Bitmap graphics/Music Written 1984-1985 by Byron Preiss and Michael Reaves. Notes: Based on the book by the same title by Michael Reaves and Byron Preiss. This game was released in two different versions, one of which contained arcade-style games that were added to the overall game. The arcade games were accessed by entering certain locations (one was in a swamp). It was possible to complete the game without entering the arcade sequences. The Commodore 64 version was 5 disks (with the arcade games on the last one). Another source reports a Commodore 64 version on two 5 1/4" disks (both sides) with arcade games. The package contains Amsel's 12-page notebook with a winged dragon on the cover, featuring a wordlist and a coded hint section. Some packages also came with a large sticker of a dragon designed to look like stained glass. Comments: The main character was a king and the adventure begun with a sea voyage. After a ship wreck the hero eventually reached a friend of his called Hawkwind who accompanied him from then onwards. You are Amsel of Fandora. Scientist. Researcher. And somewhat of a visionary. Until now, you have led your life as a hermit. But a lot has happened, and your life has changed. You can no longer afford to seek the peace and solitude you once enjoyed. For there is much to be done. But you are not alone. You have your friend Hawkwind. He knows the terrain of Simbala, for he is the leader of that great country. And, in light of what has just happened, you'll need his help and guidance. The Last Dragon has been kidnapped. The message came to you through the mystical Dragonpearl. It can tell of the past and predict the future. And though the image in the Dragonpearl is clouded with mystery, the message it conveys is clear: The Last Dragon is being held captive deep in the Southland of Simbala. Only you and Hawkwind can save him. The bond of friendship shared by the three of you permits you to do nothing less. It won't be easy. But then again, you and Hawkwind would fight to the death to save the Last Dragon. Written 1984 or 1985 by Ultrasoft. 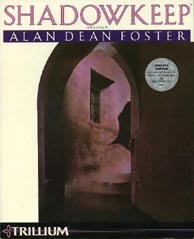 Alan Dean Foster, whose book Shadowkeep(TM) is the first novelization of a computer game (the game was created and designed by Ultrasoft), was excited about the project from the start, "Everyone seems to look upon the computer as a tool, but it's actually not a tool, it's a gate. It's a gate into other worlds, the fringes of which we've only begun to explore." Foster's understanding of computers allowed him to easily translate the book from the software (a computer first!). The book by Alan Dean Foster is called "Shadowkeep" and bears the text "A tale of wondrous adventure based on the fantastic universe created by Trillium." The book is (C) 1984 by Spinnaker Software Corporation and published by Warner Books. This is the first game to have inspired a novel by a major science fiction writer. Type: Bitmap graphics/Music Written 1985. Notes: Based on the books "Nine Princes in Amber" and "The Guns of Avalon" by Roger Zelazny. Written by a group of about 20 people. Also available in Spanish. The PC version comes on 3 5 1/4" disks. The Spanish version (at least) would only run on Amstrad PCs, but could be hacked to run on any PC. Comments: Corwin, one of the Princes of Amber, must fight his brothers for power and travel from our world into Amber. Type: Bitmap graphics/Music Written 1985 by Erle Stanley Gardner and Paisano Productions. Notes: Based on the works of Erle Stanley Gardner. Came on two 5 1/4" disks for Commodore 64/128. The package includes Criminal Defense Procedures Lawyer's Handbook Vol. 67, No. 3 containing a fold-out verb/sentence structure chart. Also includes a survey to be filled out and sent to Telarium concerning what the player thought of the breakthroughs in this game. Her name is Laura Kapp, and she looks as if she's in trouble. It doesn't take long for you to find out how: her husband wants to divorce her: Not your favorite kind of case at 7 in the evening. But then, it isn't like Perry Mason to leave an attractive young woman in distress either -- especially when her husband is Victor Kapp, the most famous restaurateur in Los Angeles. And what a case it is. Because barely 12 hours later, Victor Kapp is dead -- murdered. Laura is in jail, charged with his death. And facing trial very, very soon. Only she swears she didn't do it. And you think she might be right. You'll have to work fast -- and smart. Dig into people's lives. Like Russell Miller, the food critic whose career was ruined when he gave Victor's restaurant a bad review. Margot Duboq, Kapp's chef and the secret of his success -- she seems to have a secret of her own. And the Master's couple, Julian and Suzanne, he a bitter partner of Kapp's, she reputedly a very close friend. You'll have help: the savvy Della Street -- your secretary -- and the wily detective Paul Drake. And if you're good, you'll convince the jury that your client isn't the killer. 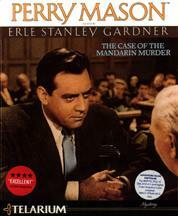 If you're very good (after all, you are Perry Mason), the real murderer will break down and confess -- but only after you've figured out the true twisted story. Type: Graphics/Music Written 1986 (rerelased by Spinnaker 1989) by Jonathan Merritt [story] and Dale Disharoon, Inc [programming]. 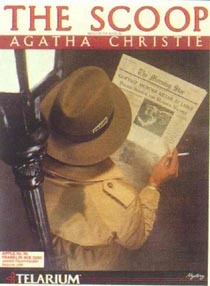 Notes: Based on a 1930s story by Agatha Christie and the London Detection Club (Dorothy L. Sayers, E.C. Bentley, Anthony Berkeley, Freeman Wills Crofts, and Clemence Dane. Features menu choice input, and recommends a joystick. This was probably the last game published under the Telarium label (though it was later published as by Spinnaker as well). Came with an 18-page manual and a newsprint front page from The Morning Star (Monday, November 9, 1930). The PC version came on two 5 1/4" disks. (compatible with Tandy 1000/3000). The Spinnaker version of the game is pretty much the same as the original. The title screen is altered some and the graphics and sound are a bit improved. Comments: A reporter from a rival is murdered while investigating the death of a young woman. As a crime reported for a London newspaper, it's up to you to "get the scoop" on who committed these deadly crimes. Get the scoop, and you'll be the top reporter in London. Fail, and you'll go back to writing obituaries ... or be one yourself. You're the new reporter at the Daily Courier, and you've just been scooped! Geraldine Tracey is murdered. No one knows who did it. Your rivals from the Morning Star have beat you to the story, and your editor is furious. Save your paper - and your job! - by solving the murder and scooping the Star. You'll have to work quickly. Question witnesses. Follow suspects. Search for clues. Why did Fisher, who discovered the body, go there that fateful Saturday night? What happened to the murder weapon? Where is Mrs. Tracey's husband? You'll have to work carefully. Some people you meet won't want to talk to you, but you might overhear what they tell their friends. Others may hide the truth, and you'll have to find them out. And remember - someone has killed once and could kill again to get rid of a troublesome reporter! Notes: Based on work by Robert A. Heinlein. This was probably never published. It was never published by Telarium, says another source, but may have sold by Spinnaker after the Telarium name was discontinued. Notes: Based on work by Philip Jose Farmer. It was never released, according to Farmer himself. In 1984, the boxes were somewhat derivative of Infocom boxes from 1984-1987. The box resembled a book with a lift up flap and a built in plastic tray containing the elements. The difference was Infocom's games came with a plastic lid and shrinkwrap over the tray. WC's had a perforated cut out cardboard flap sealing in the contents. In 1985, the boxes were regular flap types with the plastic tray sliding out. Type: Moving character graphics/Music Written 1984 by Zilpha Keatley Snyder [story], Dale Disharoon [programming] and Bill Groetzinger [graphics]. Notes: Partial map included in the package. Joystick was required to play the game. It also featured a menu choice input system. The story was based on the Green Sky Trilogy by Zilpha Keatley Snyder. 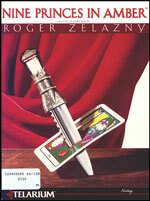 The game's name is the name of the first book in the trilogy. Ms. Snyder writes mostly for children and young adults. The Green Sky Trilogy was for young adults. 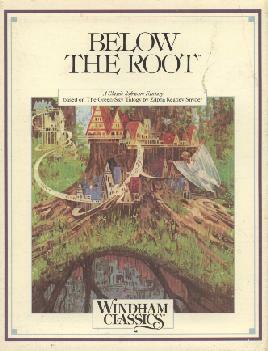 The three books in the series are "Below the Root", "And All Between", and "Until the Celebration". Green-Sky is headed for a certain disaster. Uncover the hidden secret and save this mysterious land from a resurgence of violence. Notes: Comes with a Nature Key to help you identify things on the island. As Fritz, you and your family face the challenge of survival on a deserted tropical island. As Dorothy, you'll meet many unusual and wonderful characters like the Munchkins and Scarecrow as you make your way to the Emerald City. Type: Bitmap graphics/Music Written 1985 by Ann Weil and Lee Jackson. Notes: Follows Stevenson's classic fairly close. As Jim Hawkins, search for pirate gold and for a way to outwit Long John Silver, a clever and cunning buccaneer. Notes: Features menu choices like The Scoop, but requires joystick to play. As Alice, you'll meet the Mad Hatter and other famous characters on your journey. But hurry! You must get out of this magical land before it vanishes. Notes: This game is mentioned in a Spinnaker catalog, but it is likely that the game never was published.